The Special Reserve Series are the winery’s flagship wines. This collection perfectly expresses the best in every harvest, from outstanding vineyard plots. 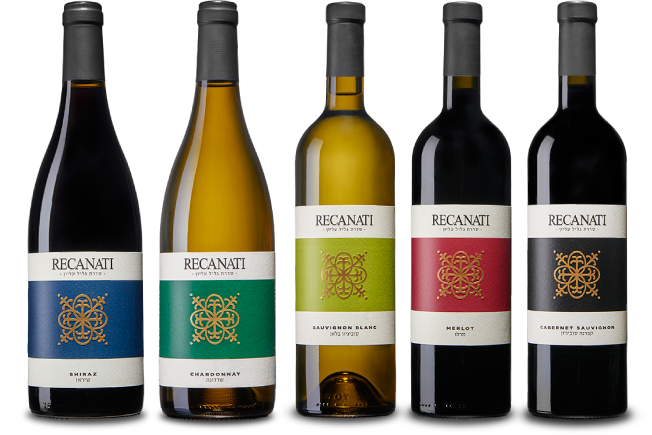 From these plots, Recanati’s winemakers produce the wines that exemplify the winery, the harvest and the terroir. This series is the pride of the winery and as such ranks every year at the top of the most respected wine magazines in the world, with a score of over 90. To maintain the highest standards, Special Reserve Red is only produced from harvests of special quality and it represents the very best of both classic and Mediterranean varieties. In this way, it illustrates the winery’s vision and the precise work of our two winemakers. The first Special Reserve White harvest – from Mediterranean Roussane and Marsanne species – was in 2012, and since then the winery has continued to pursue its Mediterranean approach and vision. This wine has been awarded more than 90 points on more than one occasion and continues to justify its place as the winery’s signature white wine. Winemaking Notes: After pressing the grapes and a slow and controlled fermentation process, the wine is aged (sur lies) in French oak barrels for eight months. Following the maturation period, the winemakers decide on the blend after a Series of tastings. To preserve the wine’s complex character and natural acidity, it does not undergo malolactic fermentation at all. Tasting Notes: An especially rich and complex wine, full-bodied, good, balanced acidity and a long, fruity aftertaste. The wine is now ready for consumption and will continue to develop and improve in the bottle in the coming years. Grape Variety: A blend that varies from harvest to harvest but always based on Mediterranean and classic Bordelaise varieties. Winemaking Notes: Once the grapes arrive at the winery, they are destemmed and gently crushed. After fermentation in tanks and pressing, the wine is transferred to new French oak barrels. During the first months of maturation, each vineyard’s produce is kept separate. Afterwards, we hold a series of tastings to determine the right “blend” from the most outstanding barrels in every harvest. Once the right blend has been crafted, the wine is returned to the barrels where it will mature further for another 18 months. To preserve its unique flavors, the wine is bottled after coarse filtration alone and is already ready for drinking, although it will mature well in the bottle over the next decade. Special Reserve Red is the winery’s signature red wine and as such, is produced only in the best harvests. Tasting Notes: Special Reserve Red is a rich, full-bodied wine with balanced acidity allowing it to mature over many years. The wine has a bouquet of chocolate and berries, black pepper and Mediterranean spices. Winemaking Notes: The grapes are handpicked, and after destemming, cold maceration, fermentation and pressing, we mature them in French oak barrels – approximately half of which are new – for 12 months. This is so the oak flavors and aroma do not overpower the exclusive flavors and aroma of the fruit. The wine is then bottled after coarse filtration alone and drunk as is – authentic, wild and Israeli. Tasting Notes: The wine has a black plum, berries and pecan taste, with a full body, balanced acidity and a long and spicy aftertaste. Vineyards: Judean Hills – Dry Farm Vineyard (unwatered). The Carignan is trained as "Bush Vine," a trellising system used in ancient times. The roots wind and twist into the soil – to the more mineral areas – in a constant search for water, which causes the aroma and color so unique to this wine. Winemaking Notes: Marselan grapes are relatively new in Israel. Recanati Winery unvailed the first harvest of this variety in 2012, and we continue to be impressed by its power. To restrain the strong vines and generate low yield, the vineyard is thinned during the ripening period. From the remaining grapes we receive the array of unique flavors and aromas characteristic of this variety. The wine is matured for 12 months in French oak barrels – approximately half of which are new, and then bottled after coarse filtration alone. Winemaking Notes: The grapes are handpicked, arrive at the winery and undergo a process of destemming, fermentation and pressing before being sent to mature for 12 months in French oak barrels, approximately half of which are new. The wine is then bottled without any of the clarification processes and after coarse filtration alone, to preserve the gamut of flavors. Tasting Notes: A juicy, strong-tasting rich wine, with a purple, deep bluish color. The wine excels in flavors and aromas, displaying a range of berries and chocolate, spices and walnuts. Vineyards: Jezreel Valley. A mature vineyard. The roots of the Petite Sirah twisted and turned deep into the heavy valley soil and the vine trunks branched out and thickened over the years, a process that contributed to the richness and depth of flavors in this wine. Winemaking Notes: The grapes arrive at the winery for destemming and gentle crushing. They are then fermented in small, one-ton bins – “Dolavs” – without using pumps at all during the fermentation. Syrah grapes are fermented with almost half of the stalks put back into the bins. According to the traditional method, this contributes to the production of more authentic Syrah wines and preserves the character of this grape variety. The wine is matured for 12 months in French oak barrels, approximately 25% of which are new, and is bottled without any of the clarification processes and after coarse filtration alone. Tasting Notes: A spicy, flowery and elegant wine. It has a strong purple-red color and a distinct aroma of violets and lavender, red fruit and black pepper. In recent years there has been renewed interest in researching our region’s local grapes, varieties from which wine was produced thousands of years ago – in the times of Jesus, the Romans and King David. During the Mameluke and later the Ottoman periods, the local authorities forbade the preparation of wine and so the local wine industry suffered a serious setback. Local grape varieties that had been used to make wine gradually became extinct and only a few grape varieties – seemingly tasty to eat as well – barely survived. 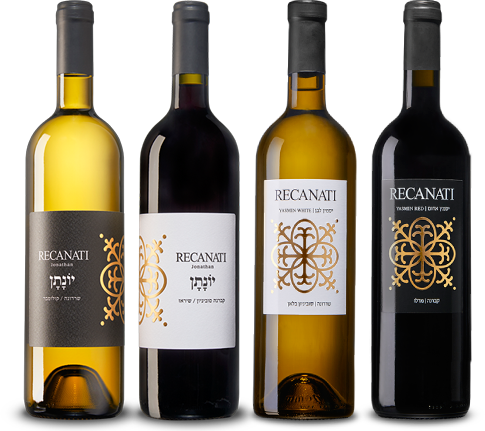 Recanati Winery is proud to be the first winery to restore the ancient Marawi variety to wine glasses in Israel and the world. We produced only 2,480 bottles from the first 2014 harvest and the wine boasts a score of 90 points from renowned wine critic, Robert Parker, in “Wine Advocate”. The winery is currently working on producing other local varieties. Winemaking Notes: The grapes are handpicked in mid-September and transferred in refrigeration to the winery. There they are destemmed and crushed. The wine ferments and ages sur lies in year-old French oak barrels. Tasting Notes: The wine is citrusy, with a wonderful acidity and distinct minerality. This wine is a pure, ancient and candid expression of the Israeli terroir. Winemaking Notes: Bittuni is a local ancient variety, from which red wines were already being made thousands of years ago. This variety was almost extinct, and only a few vines remained. Here at Recanati we are proud and excited to offer you a red wine from this ancient grape variety. The Bittuni grapes were hand-harvested in mid-September and transported under refrigeration to the winery, where they underwent gentle fermentation with the rachises. The wine was then matured for six months in year-old Burgundy oak barrels. Tasting Notes: A wine with light, flowery and aromatic minerality, with a bouquet of red cherries and Mediterranean spices. The classic varieties, originating in Bordeaux, are elegant varieties representing the most traditional, reserved and precise winemaking. These varieties require a growing area with a cool climate and appropriate soil. Recanati’s winemakers chose to plant our choicest vineyards in the Upper Galilee, more than 800 meters above sea level, in chalky, Terra Rossa soil. The ideal climatic conditions in this region are reflected in the natural and balanced acidity and the richness of flavors characteristic of the Reserve Wines. Winemaking Notes: fter fermenting and macerating for 10 days, the wine ages in French oak barrels for approximately 18 months. It is then bottled after coarse filtration alone. This preserves its aroma and array of flavors. The wine is now ready to drink, although it will continue to develop and improve in the bottle as the years go by. Winemaking Notes: The grapes are handpicked, arrive at the winery and are destemmed, pressed after fermenting and macerated for 10 days. The wine matures in French oak barrels over 18 months. It is then bottled after coarse filtration alone. The wine is now ready to drink, although it will continue to develop and improve in the bottle as the years go by. Tasting Notes: The wine has soft, round and gentle tannins, and a full, rich body, balanced acidity and a long and spicy aftertaste. The wine is rich in cassis, cherry, black plum, nuts and Mediterranean spicy herbs. Vineyards: Upper Galilee – Lebanon Vineyard. Located opposite Lebanese mountains, which funnel particularly cold air and create unique micro-climate conditions. Winemaking Notes: The grapes are handpicked in the Manara Vineyard in the Upper Galilee. They arrive at the winery and are destemmed, pressed and sent to ferment in French oak barrels. This wine is aged sur lies for nine months. This preserves its flavors and the inimitable Chardonnay aroma. 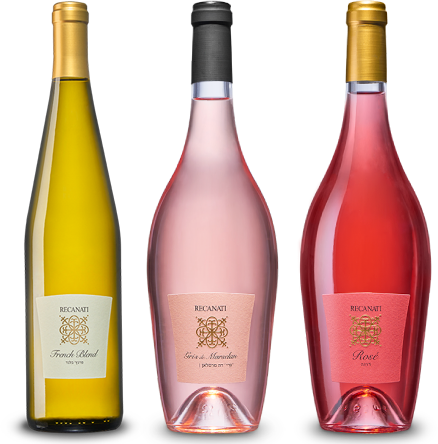 Recanati Winery first began producing a light Rosé in 2014 called “Gris de Marselan.” It joined the winery’s classic Rosé and we became the only winery in Israel producing two types of Rosé – at two levels with different traits, from unique varieties and using two distinct winemaking styles. Judean Hills – Upper Galilee, Manara VineyardIn recent years there has been an increase in Rosé wine consumption In Israel, and we welcome this trend. These wines are particularly suited to our regional climate and compliment many foods common in our area. The wines have balanced acidity and are light and fruity with low alcohol. 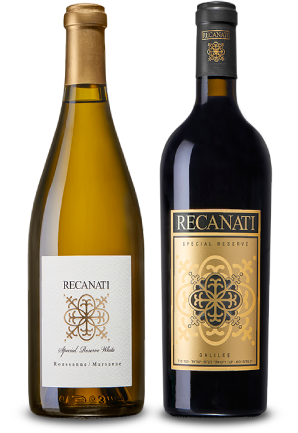 Winemaking Notes: Recanati’s French Blend is made from French Colombard grapes together with a little Sauvignon Blanc and Muscat. The wine was fermented at low temperature to preserve the grapes’ natural fragrances. Fermentation was stopped with a small amount of natural sugar from the grapes remaining in order to create a wine with a delicate sweetness. Tasting Notes: A refreshing wine with aromas and tastes of yellow plums, peaches and melon. Winemaking Notes: : The name “Gris” (grey) in French refers to a wine gentler and lighter in color than Rosé. Gris is produced after the grape skins have been macerated for only a few hours, so the wine adsorbs minimal color and becomes pink with a very gentle flavor. After crushing the grapes, we check the color of the grape juice every hour. Once we have reached the desired hue, we remove it from the tank and it ferments by itself in a separate tank. This process is called “bleeding.” The result is a particularly elegant and refined wine, with a very clear hue and a personality in between Rosé and White. Tasting Notes: The wine has abundant aromas of flowers, citrus and white fruits. It can be an excellent aperitif or drunk with a meal enhanced by Asian, French or Middle Eastern seasoning. Winemaking Notes: The Barbera grapes, which maintain their natural acidity, are destemmed and undergo light crushing. They are then sent straight to gentle pressing and cold fermentation. This is to preserve the wine’s fruity flavors, natural acidity and the refreshing Barbera aroma. The Merlot grapes, from the Manara Vineyard in the Upper Galilee, start off by macerating in stainless steel tanks. When Recanati’s winemakers reach the perfect color from macerating the grapes on their skins, they remove the required 20% juice from the tank. This process is called “bleeding.” The two species are then fermented together and not aged in barrels at all, because we want to preserve the light and refreshing Rosé flavors. Tasting Notes: Recanati’s classic Rosé is a fruity wine, medium-bodied and refreshing, that maintains a fine balance between acidity and alcohol. The wine has abundant aromas of fresh strawberry, grapefruit and citrus blossoms. Consisting of thoughtfully chosen blends, these wines are young, light and fruity, revealing flavors that reflect the warmth of the Israeli sun. Winemaking Notes: Recanati’s Yasmin White is produced from a blend of two classic varieties, Chardonnay and Sauvignon Blanc. The winemaking method stresses the lightness of the wine and the fruity aroma together with its refreshing acidity. We achieve this fruity aroma thanks to a relatively slow fermentation at low temperatures. This preserves the gentility of the aromas and allows us to produce a light wine with balanced acidity. Tasting Notes: An aromatic wine, rich and refreshing with white fruits, melon and tropical fruit flavors. Tasting Notes: The wine is rich in fruit flavors and carries the aromas of black plums, spices and oak. It has a refined body and balanced acidity allowing the consumer to enjoy it while it is still young. Winemaking Notes: Recanati’s White Jonathan is made from a combination of two classic grape varieties, Chardonnay and Colombard. Our winemaking method accentuates the wine’s gentle and fruity aroma. The Chardonnay contributes white tropical fruit aromas and a balanced structure, while the Colombard endows the wine with scents of citrus and flowers as well as a refreshing acidity. Tasting Notes: A refreshing wine with a bouquet of white flowers, pear, green apples and tropical fruits. Winemaking Notes: Recanati’s Red Jonathan is made from a combination of two choice grape varieties, Cabernet Sauvignon – which contributes a full body and a range of black fruit aromas, and Shiraz, which provides freshness, the scents of fresh purple fruit and spices. Our winemaking method accentuates tannin softness and fruity aroma combined with oak fragrance. The balance of tastes and aromas is achieved through a relatively short and cold fermentation of 6-10 days at controlled temperature. Tasting Notes: A rich, full-bodied wine with balanced acidity and a silky texture. The wine shows aromas of black plums, cherries and violets and has balanced acidity, allowing it to be enjoyed while still young.